In order to define charset for HTML5 Doctype, which notation should I use? In HTML5, they are equivalent. Use the shorter one, it is easier to remember and type. Browser support is fine since it was designed for backwards compatibility. Save your file(s) in UTF-8 encoding without the byte-order mark (BOM). Declare the encoding in your HTML files using meta charset (like above). Your web server must serve your files, declaring the UTF-8 encoding in the Content-Type HTTP header. This will configure Apache to serve your files declaring UTF-8 encoding in the Content-Type response header, but your files must be saved in UTF-8 (without BOM) to begin with. Notepad cannot save your files in UTF-8 without the BOM. A free editor that can is Notepad++. On the program menu bar, select "Encoding > Encode in UTF-8 without BOM". You can also open files and re-save them in UTF-8 using "Encoding > Convert to UTF-8 without BOM". More on the Byte Order Mark (BOM) at Wikipedia. Consistency helps to reduce errors and make code more readable. Note that the charset attribute is case-insensitive. You can use UTF-8 or utf-8, however UTF-8 is clearer, more readable, more accurate. Also, there is absolutely no reason at all to use any value other than UTF-8 in the meta charset attribute or page header. UTF-8 is the default encoding for Web documents since HTML4 in 1999 and the only practical way to make modern Web pages. Also you should not use HTML entities in UTF-8. Characters like the copyright symbol should be typed directly. The only entities you should use are for the 5 reserved markup characters: less than, greater than, ampersand, prime, double prime. Entities need an HTML parser, which you may not always want to use going forward, they introduce errors, make your code less readable, increase your file sizes, and sometimes decode incorrectly in various browsers depending on which entities you used. Learn how to type/insert copyright, trademark, open quote, close quote, apostrophe, em dash, en dash, bullet, Euro, and any other characters you encounter in your content, and use those actual characters in your code. The Mac has a Character Viewer that you can turn on in the Keyboard System Preference, and you can find and then drag and drop the characters you need, or use the matching Keyboard Viewer to see which keys to type. For example, trademark is Option+2. UTF-8 contains all of the characters and symbols from every written human language. So there is no excuse for using -- instead of an em dash. It is not a bad idea to learn the rules of punctuation and typography also ... for example, knowing that a period goes inside a close quote, not outside. Using a tag for something like content-type and encoding is highly ironic, since without knowing those things, you couldn't parse the file to get the value of the meta tag. No, that is not true. The browser starts out parsing the file as the browser's default encoding, either UTF-8 or ISO-8859-1. Since US-ASCII is a subset of both ISO-8859-1 and UTF-8, the browser can read just fine either way ... it is the same. When the browser encounters the meta charset tag, if the encoding is different than what the browser is already using, the browser reloads the page in the specified encoding. That is why we put the meta charset tag at the top, right after the head tag, before anything else, even the title. That way you can use UTF-8 characters in your title. That is not strictly true. If you only have US-ASCII characters in your document, you can Save it as US-ASCII and serve it as UTF-8, because it is a subset. But if there are Unicode characters, you are correct, you must Save as UTF-8 without BOM. If you want a good text editor that will save your files in UTF-8, I recommend Notepad++. On the Mac, use Bare Bones TextWrangler (free) from Mac App Store, or Bare Bones BBEdit which is at Mac App Store for $39.99 ... very cheap for such a great tool. In either app, there is a menu at the bottom of the document window where you specify the document encoding and you can easily choose "UTF-8 no BOM". And of course you can set that as the default for new documents in Preferences. 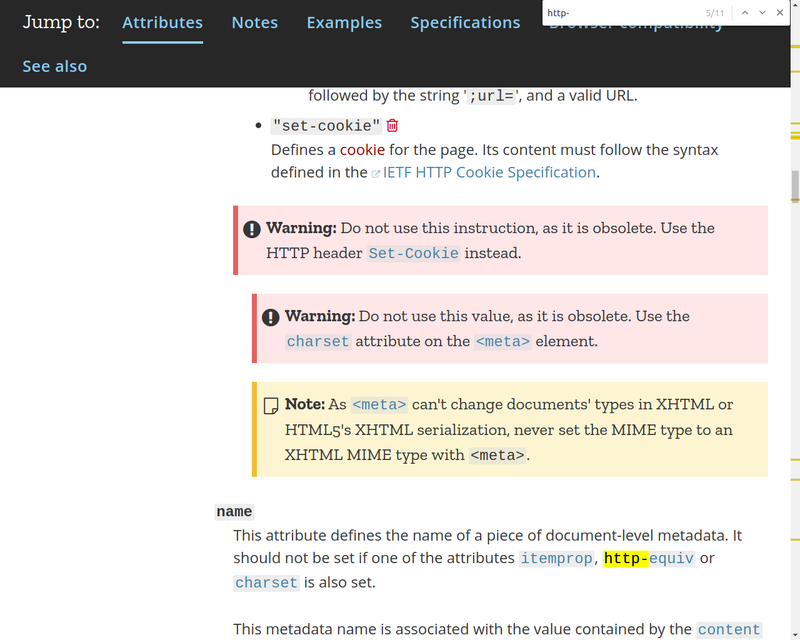 But if your Webserver serves the encoding in the HTTP header, which is recommended, both [meta tags] are needless. That is incorrect. You should of course set the encoding in the HTTP header, but you should also set it in the meta charset attribute so that the page can be Saved by the user, out of the browser onto local storage and then Opened again later, in which case the only indication of the encoding that will be present is the meta charset attribute. You should also set a base tag for the same reason ... on the server, the base tag is unnecessary, but when opened from local storage, the base tag enables the page to work as if it is on the server, with all the assets in place and so on, no broken links. A tip for serving both UTF-8 and Latin-1 (ISO-8859-1) files is to give the UTF-8 files a "text" extension and Latin-1 files "txt." Finally, consider Saving your documents with Unix line endings, not legacy DOS or (classic) Mac line endings, which don't help and may hurt, especially down the line as we get further and further from those legacy systems. An HTML document with valid HTML5, UTF-8 encoding, and Unix line endings is a job well done. You can share and edit and store and read and recover and rely on that document in many contexts. It's lingua franca. It's digital paper. <meta charset="utf-8"> was introduced with/for HTML5. As mentioned in the documentation, both are valid. However, <meta charset="utf-8"> is only for HTML5 (and easier to type/remember). In due time, the old style is bound to become deprecated in the near future. I'd stick to the new <meta charset="utf-8">. While not contesting the other answers, I think the following is worthy of mentioning. While the specs say that the encoding declaration must be within the first 512 bytes of the document, most browsers will try reading more than that. Please mind that it's very important that you explicitly declare the encoding. Letting browsers guess can lead to security issues. Use <meta charset="utf-8" /> for web browsers when using HTML5. Do not use this value (http-equiv=content-type) as it is obsolete. Prefer the charset attribute on the <meta> element. Not the answer you're looking for? Browse other questions tagged html5 meta-tags doctype or ask your own question. In <head>, which comes first: <meta> or <title>? What character encoding meta tag should I use for a mobile website? If sending charset within content-type header, still advisable to send within head tag via meta tag? Is the charset meta tag required with HTML5? Should I avoid the usage of the http-equiv=“content-type” meta tag in html? Are there HTML5 compliant alteratives to the http-equiv Cache-Control and Pragma directives? <meta charset=“utf-8”> or <meta http-equiv=“Content-Type”>, which should I use? Content/Character Encoding - Why Does HTTP Header(Content-Type) Take Precedence Over Meta Tags(Http-Equiv)?